Mercury Point of Sale is a complete business management solution with multiple bookkeeping functions to help you manage your daily financial tasks. Receive payments. Record customer payments on house accounts and immediately update balances. Manage accounting. With a few clicks, you can set up a QuickBooks Chart of Accounts as well as view and print sales information. Monitor credit card activity. View all approved, unapproved or unsettled credit card transactions and monitor a store’s credit card authorizations. Generate statements. Help maintain an even cash flow by regularly generating customer statements via print, fax or email. Create business reports. FTD Mercury allows you to generate a wide variety of reports to assist in your shop’s daily operations. The majority of reports are displayed in Microsoft Excel. The Mercury Marketing module helps you create your own direct mail, text message and email marketing campaigns in minutes, expanding your potential orders and leveraging your existing customer base. Simple customization. Users can choose from more than 50 pre-built letter, postcard and email templates. Seamless integration. Mercury Marketing integrates with the FTD Market for You program. Target customers. Send campaigns to specific customer segments, such as top customers and those who haven’t ordered in a while. 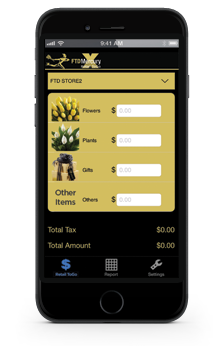 FTD Mercury Retail ToGo allows you to quickly process cash or credit card sales anywhere using an iPhone or Android device and credit card reader that are fully integrated with Mercury Point of Sale.1 It’s perfect for use at bridal shows, open houses, pop-up retail locations and more! Paperless technology. Receipts are conveniently sent to your customers via email or text. Low monthly fee. Only $9.99 per month for support and a one-time fee for use with FTD Mercury Retail ToGo. 1Mercury Point of Sale and FTD Cash-Flo are required. 2Credit card reader must be purchased from FTD for use with FTD Mercury Retail ToGo.